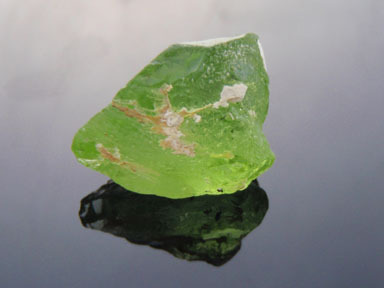 This is a listing of just some of the beautiful gem rough that I have available which you may select from and have cut. 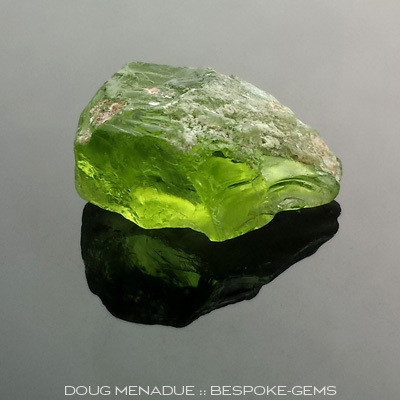 Please note this represents only some of the material that I have in stock and is by no means exhaustive. 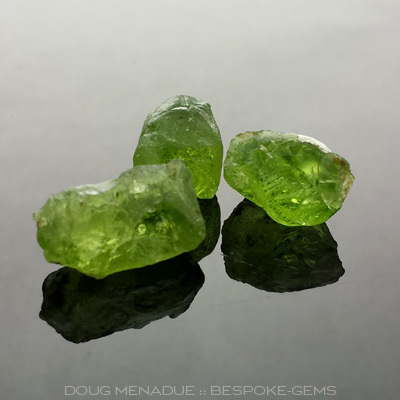 I am always getting in new rough which may not be listed here. 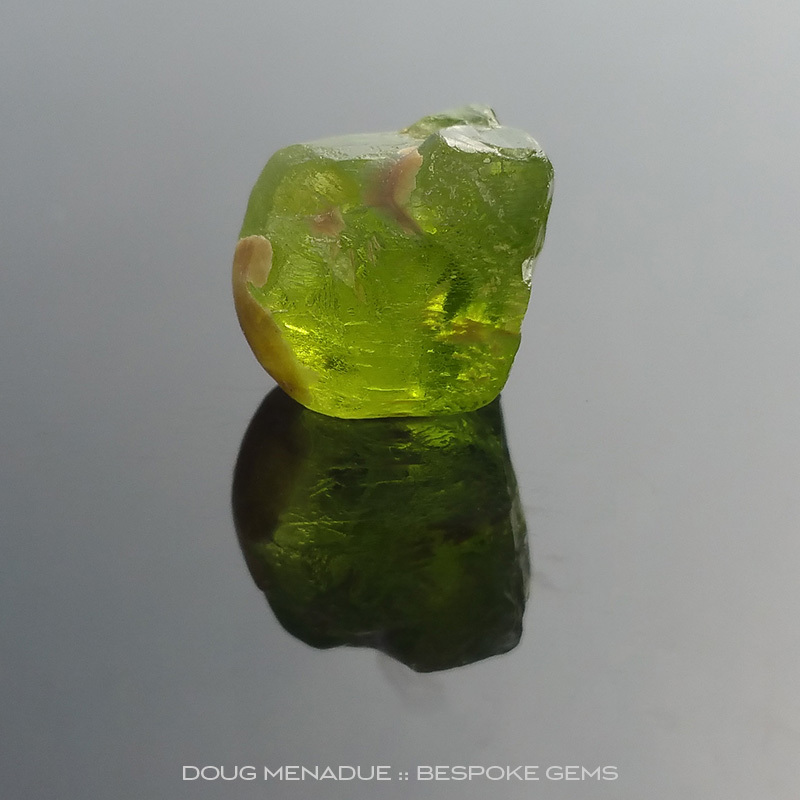 Also please bear in mind that whilst I try my best to keep my website upto date, some piece may no longer be available as they have been cut. 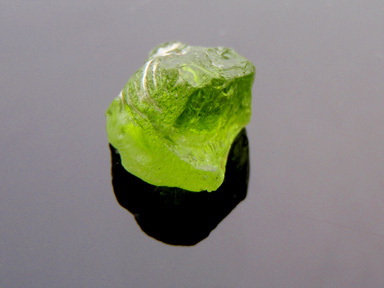 Consider those pieces eye candy. 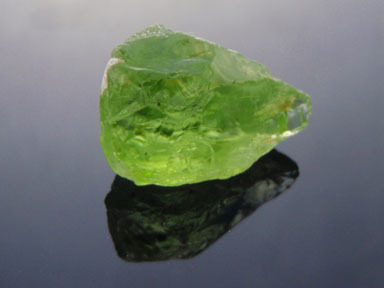 Contact me for more information or if you are interested in having a stunning gemstone cut. 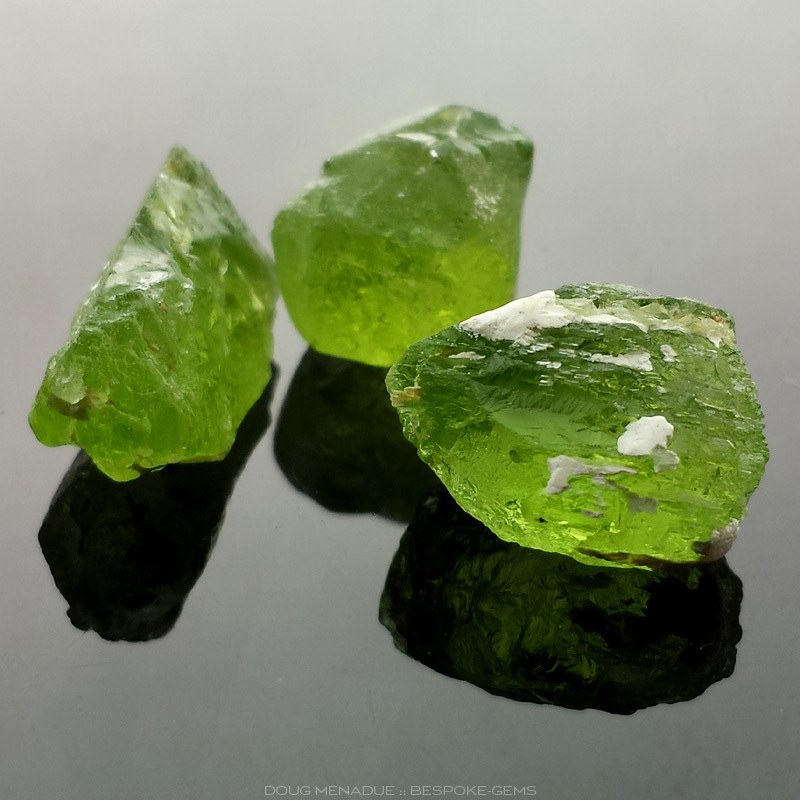 If you are looking for something in particular and it's not listed here, contact me and I will do my best to source it for you. 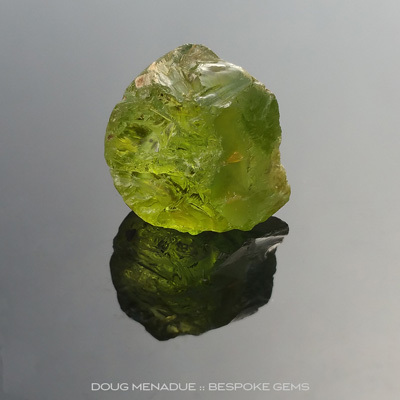 Comments : A lovely little parcel of classic Pakistani peridot that will cut rounds or cushions in the 7 to 9mm range, maybe a fraction bigger for the larger pieces. 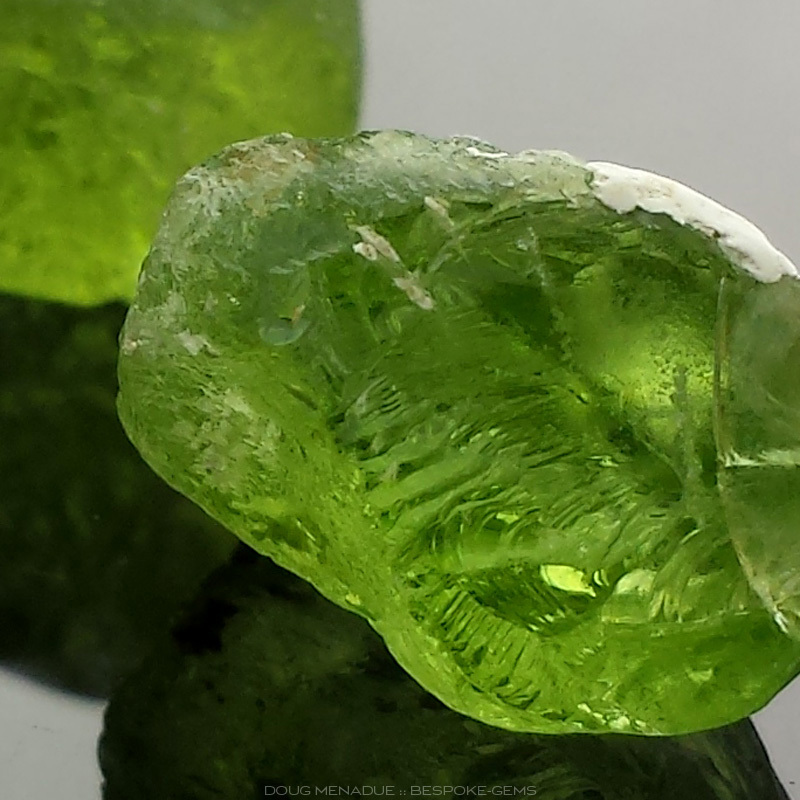 Comments : Pakistani Peridot is simply devine and always cuts a beautiful gem. 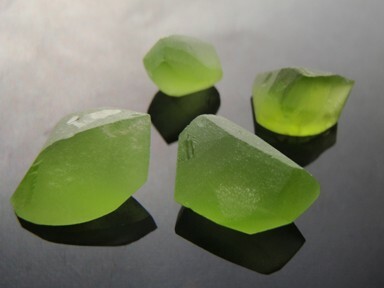 These stones are lovely and a wonderful green colour. 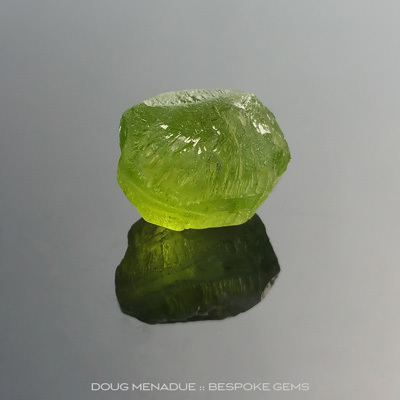 Should cut 7-8mm round (Round Brilliant, etc). 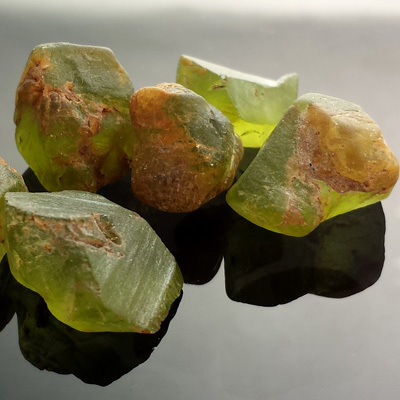 Comments : Cheviot Hills is a remote cattle station in Queensland that has a small peridot deposit. 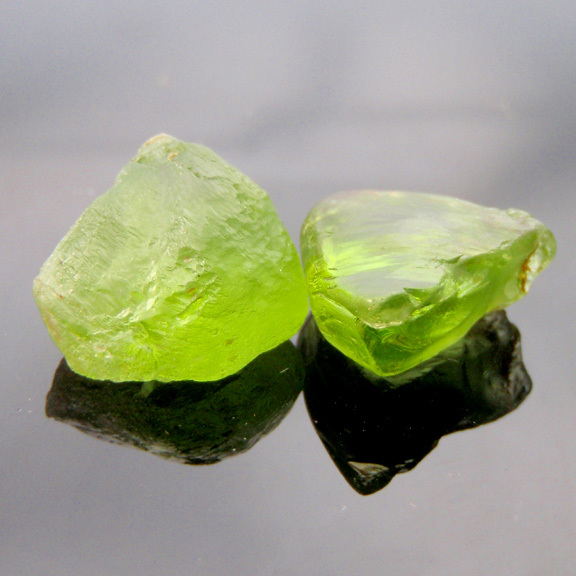 You can tell by the landscape and rock that this country saw alot of volcanic activity once. 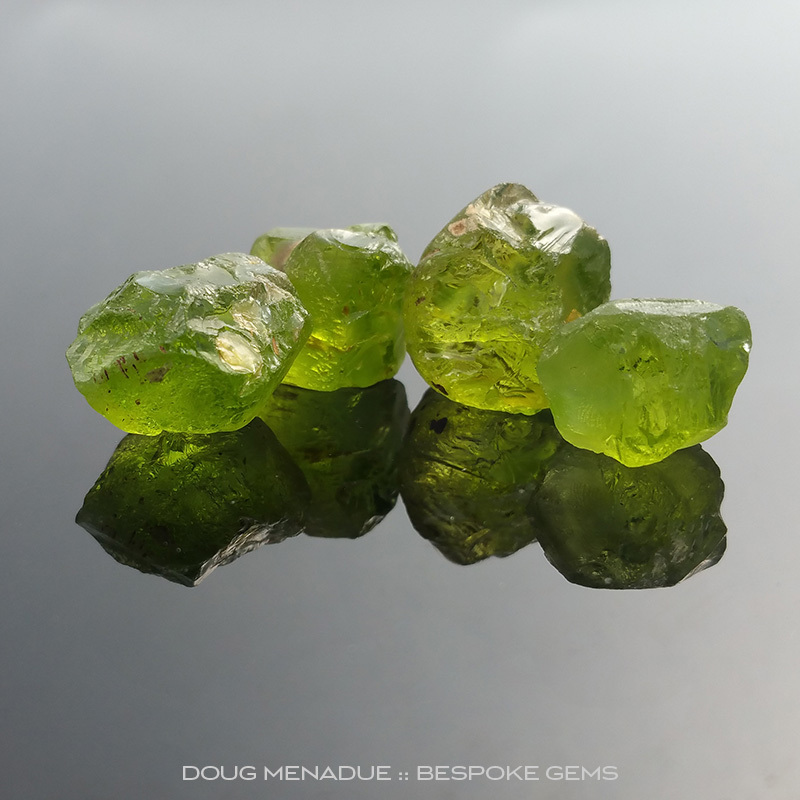 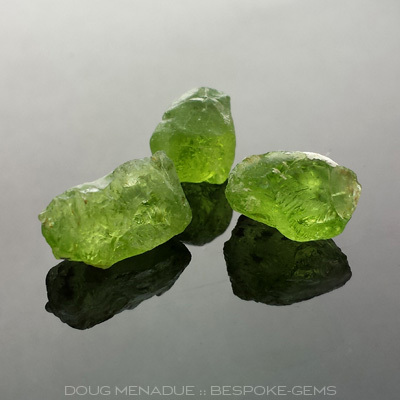 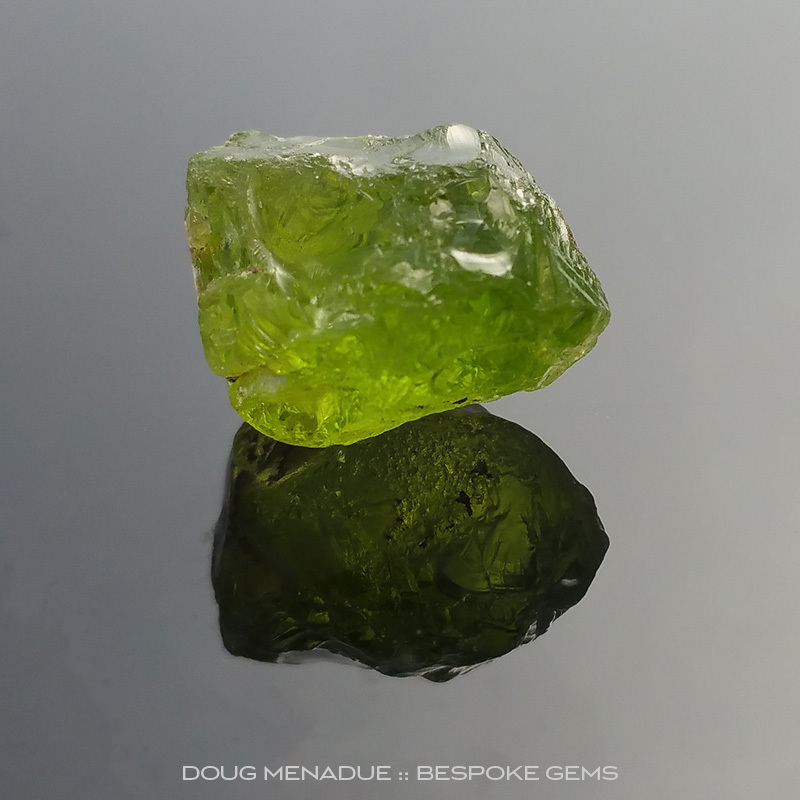 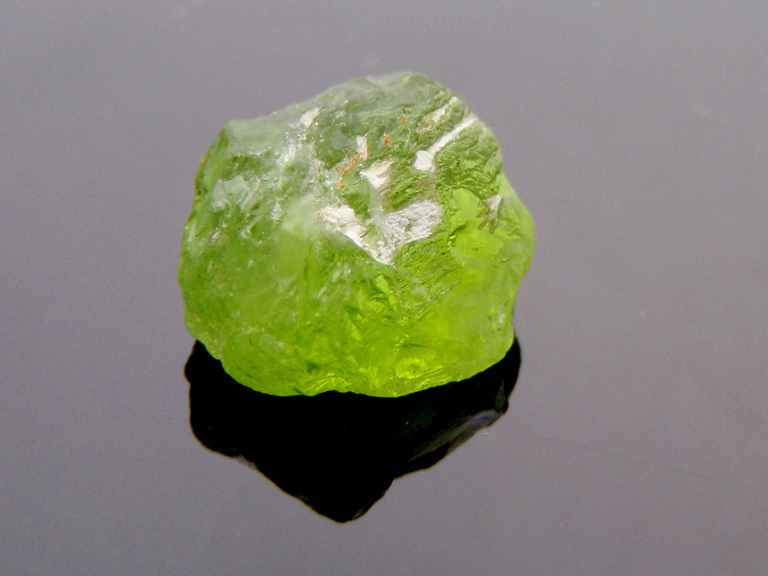 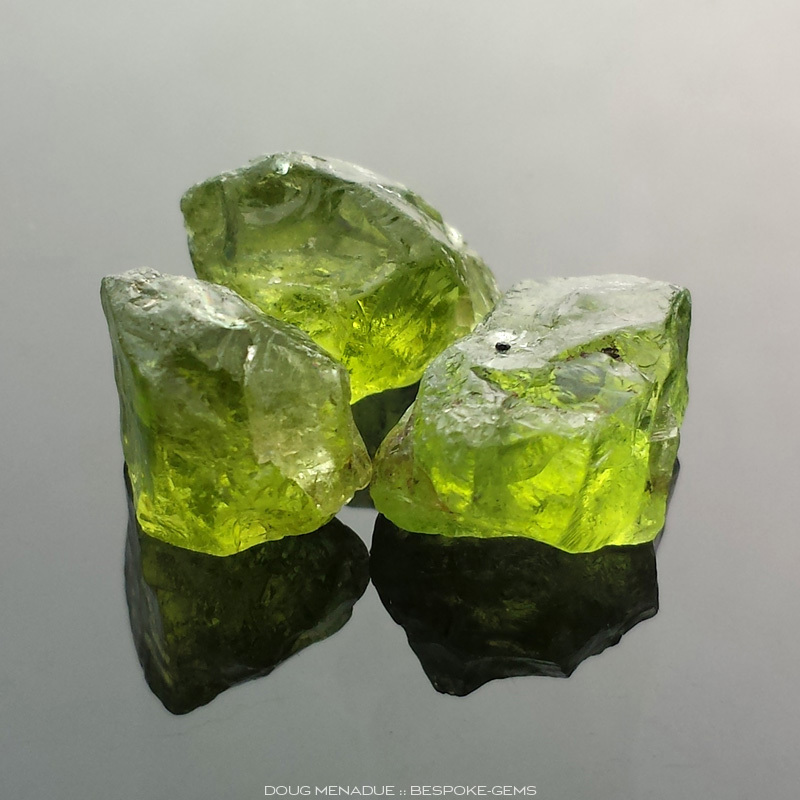 The peridot is found in basalt rock and can be very hard to spot when fossicking. 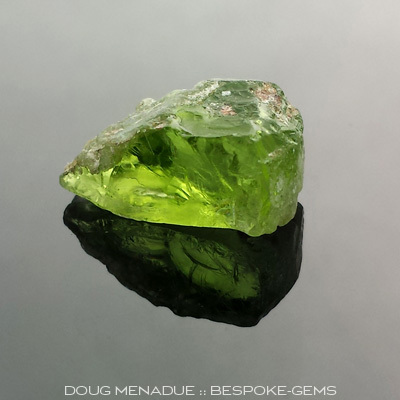 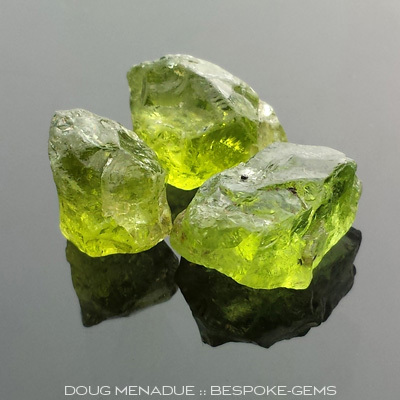 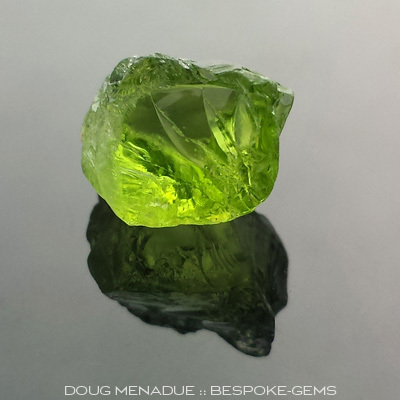 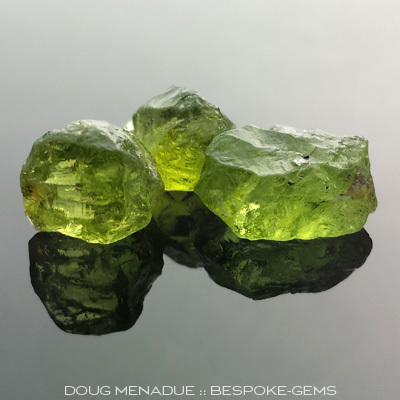 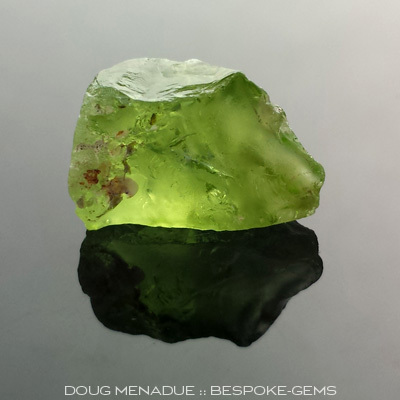 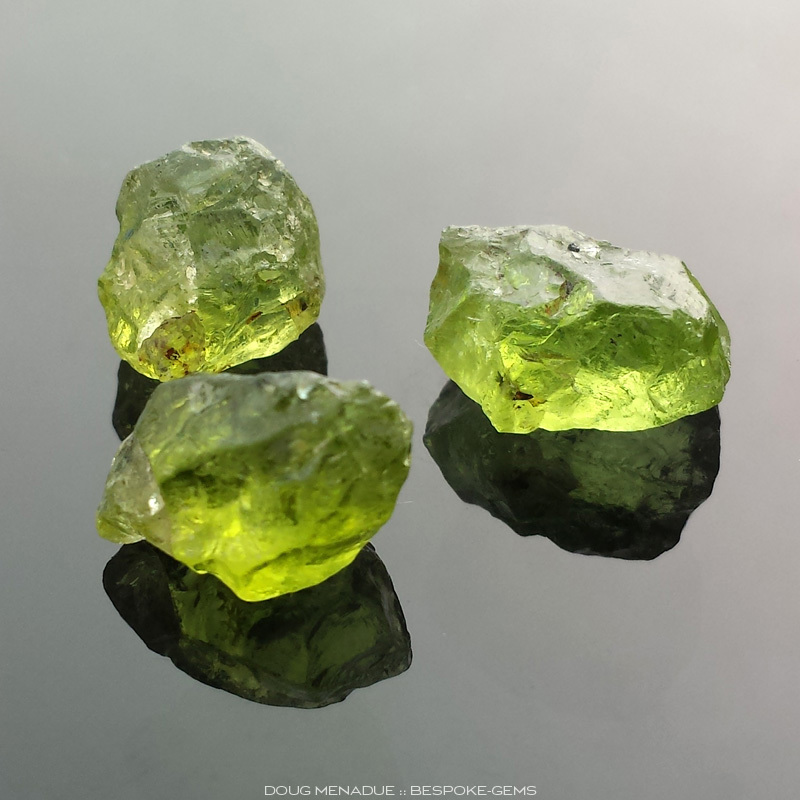 When the peridot is faceted, the gems are a lovely nice bright green and really sparkle nicely. 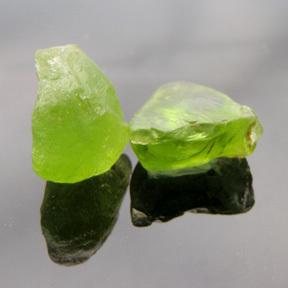 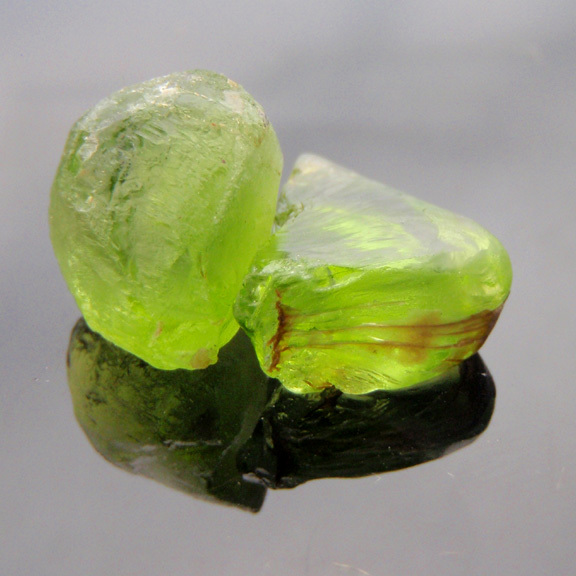 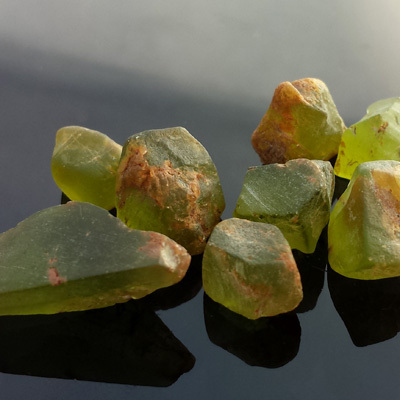 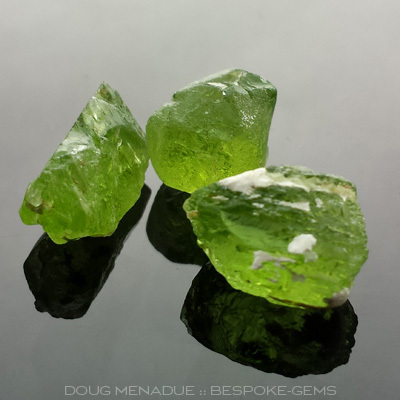 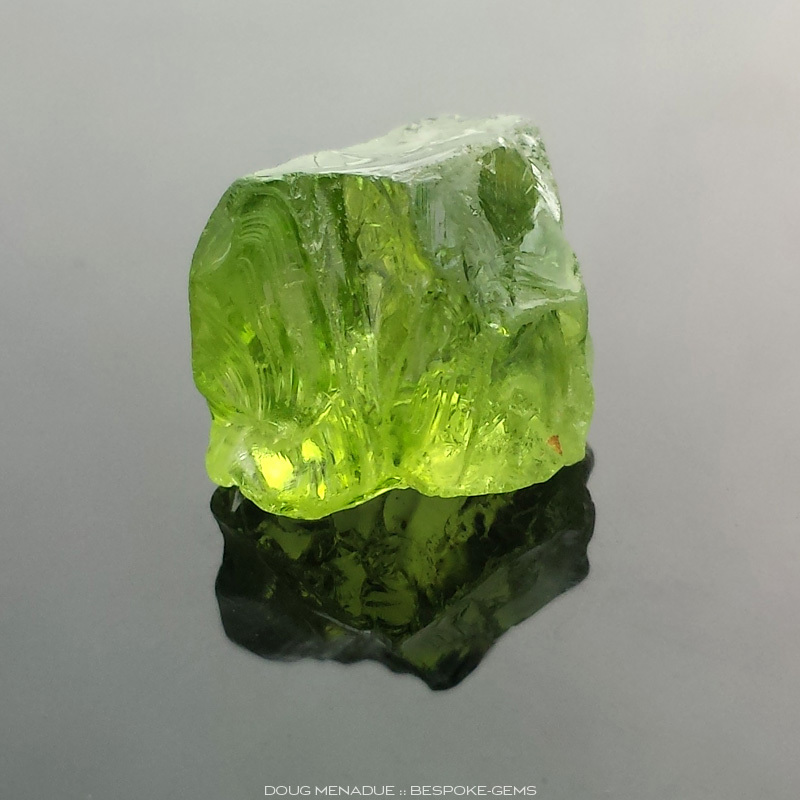 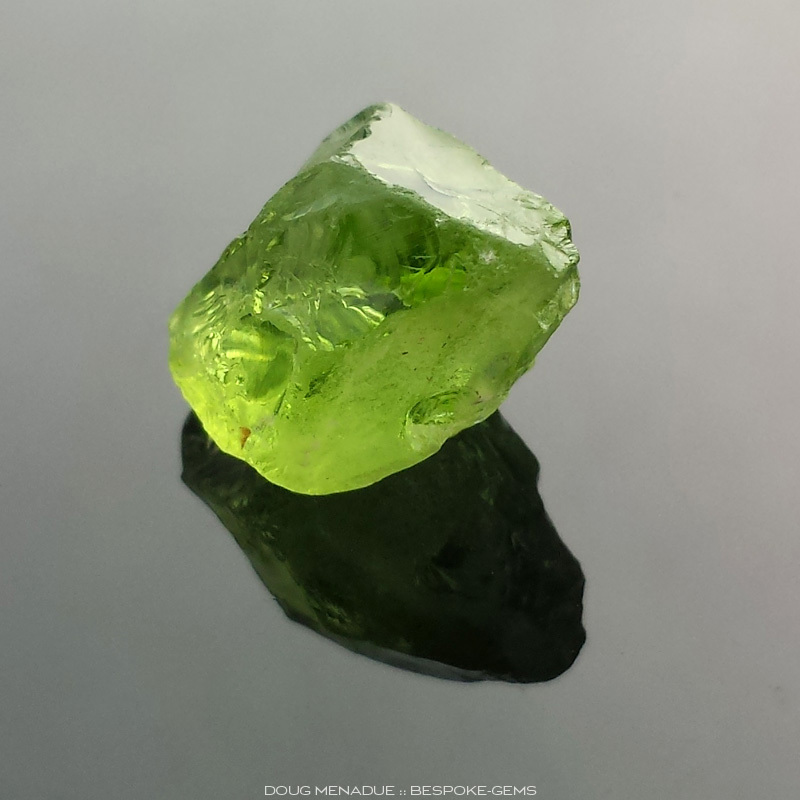 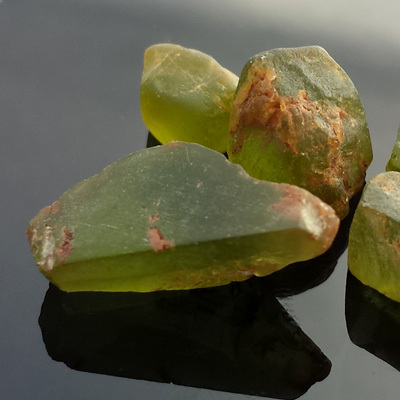 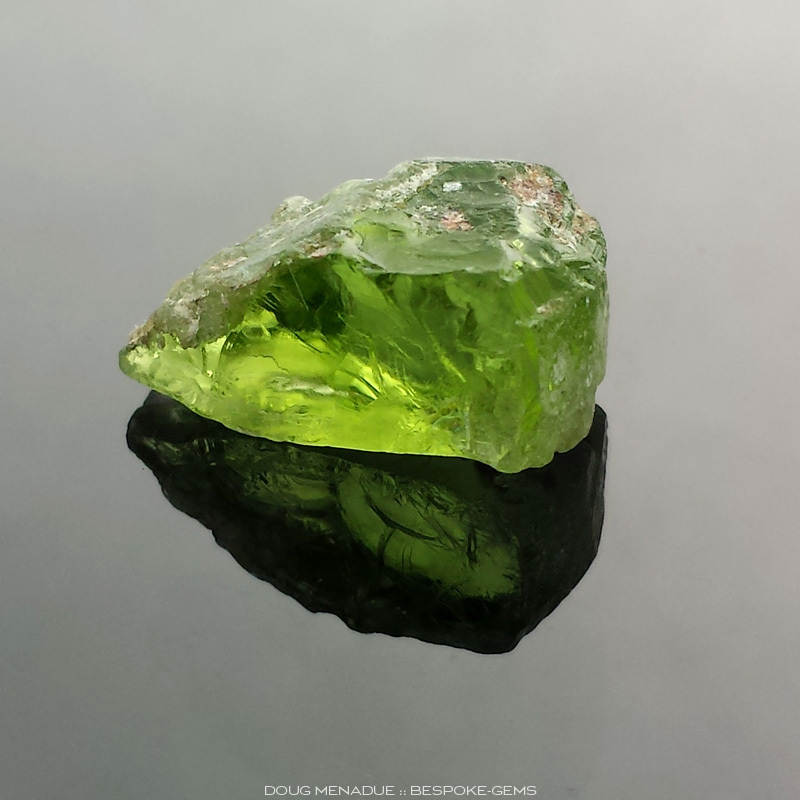 I have a limited quantity of peridot from Cheviot Hills that will cut mixed sizes and designs. 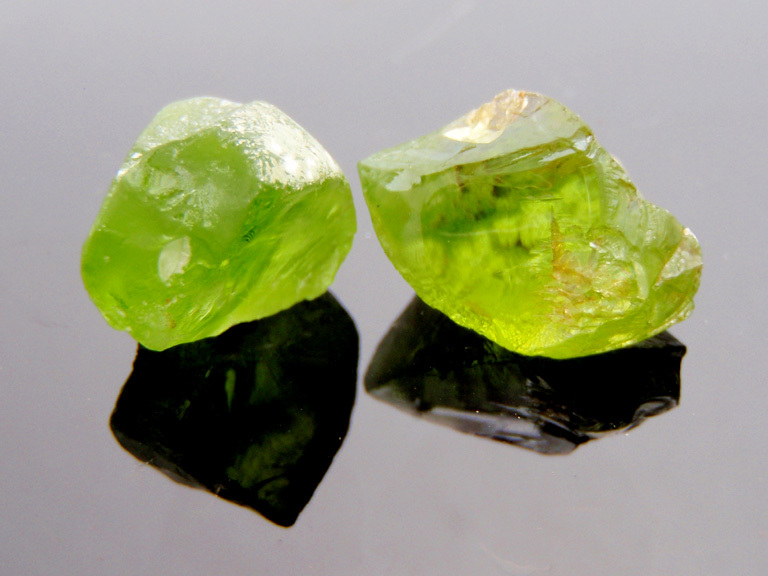 Comments : Pakistani peridot is one of the most sought after peridots due to its lovely apple green tones. 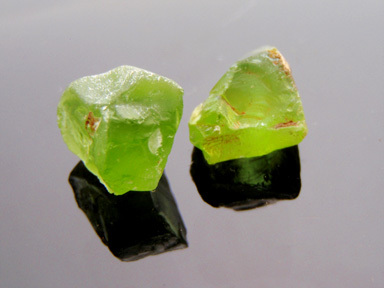 Alot of peridot has strong olive overtones but the Pakistani material seems to have less of this. 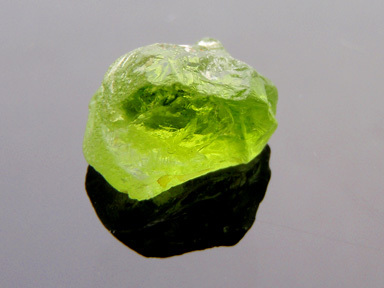 This material looks great when cut. 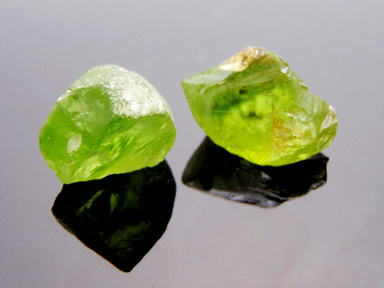 Comments : A beautiul classic piece of Pakistani Peridot. Should cut 7mm round or maybe a square cushion (Victoria Regent). 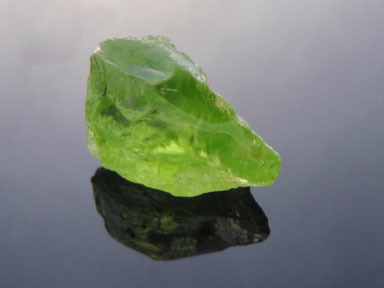 Comments : A beautiul classic piece of Pakistani Peridot. Should cut 8mm round or 8x10mm oval. 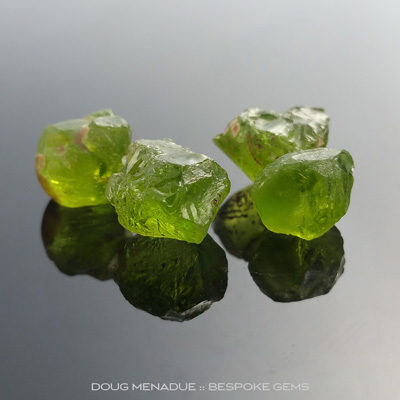 Comments : Nicely coloured peridots that should cut up to 8mm. 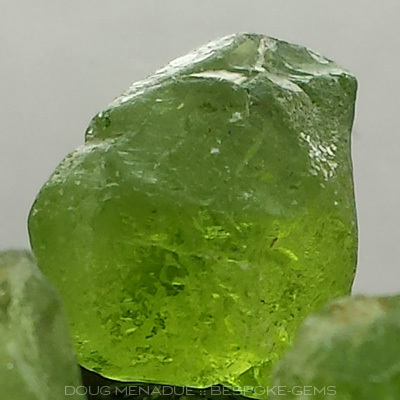 Comments : A lovely green Pakistani peridot that should cut around the 8mm size. It has excellent colour and is not as yellow as the pics suggest. This is a fine stone and will cut an exceptional gem. Comments : Two beautiful green Pakistani peridots that would make a fine matched pair of gemstones. They will probably cut around the 7mm size. 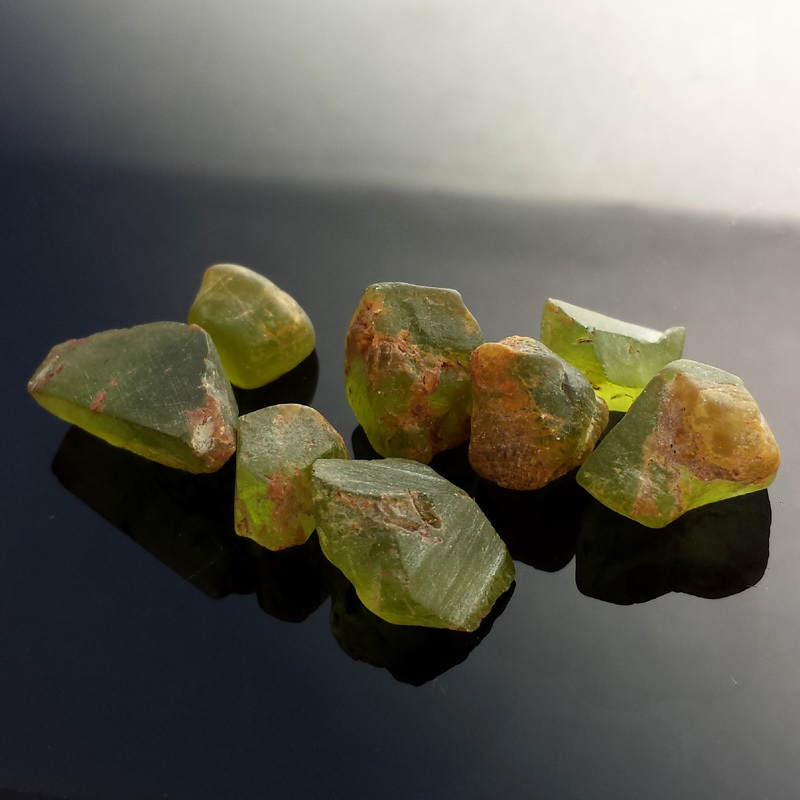 The gems are a nice strong green colour and nicer in person then what the pics show and are not as yellow as the pics suggest. A fine pair of peridots. Comments : A gorgeous green Pakistani peridot that will cut a beautiful gemstone. 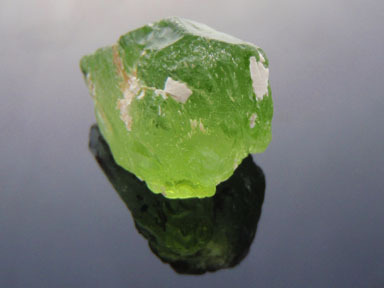 This Pakistani material is getting very difficult to obtain in top qualities.